Contributors examine how our hidden, institutionalized violence to animals, epitomized by industrial farming and laboratory experimentation, coexists with spectacles of human-caused suffering, degradation and destruction of animals in “visible but not seen” forms, such as circuses and road kill. 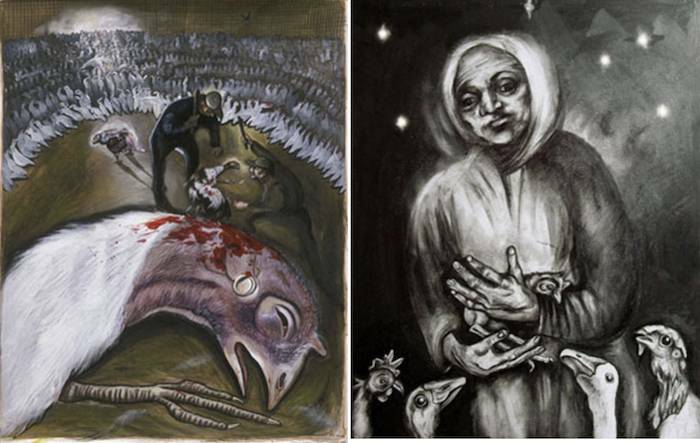 A theme throughout is the conflict in human life between a desire for “absolute mastery” over animals versus “a deep, primary disposition of sympathy” for animals. Thus far, the desire for mastery has outstripped the disposition of sympathy to such a degree that the driving forces of modern life and their psychological underpinnings are inflicting unprecedented terror and violence on animals across the earth. Contributor Josephine Donovan cites a “process of deep social conditioning” that obscures and represses humanity’s sympathetic identification with other beings. In traditional societies, elaborate expiation ceremonies frequently attend animal killings, and in modern society the public is prevented from seeing laboratory experiments and slaughterhouse practices, suggesting that people care about animals and shudder at hurting and murdering them. Yet the question is why, instead of nurturing and cherishing the human-animal bond, do human societies expend enormous ceremonial and institutional energy to dampen, distort, and destroy this bond? If human sympathy with other creatures is so deep, why is it so weak? Why do we create social conditioning processes that subvert and pervert our bond with other animals, damaging our psyches and theirs and the planet we live on? Even so, Llorente and other contributors argue that Marx’s analysis of the “alienation” and abuse endured by industrial workers, particularly those toiling in the bottommost tiers of manufacture under capitalism in Third World countries, applies to the situation of animals. Industrial workers invisibly make the stuff we buy cheap without a thought of the toil that went into each thing, because the “traces of production” are effaced from sight in the final product. Similarly, the crushing oppression and wracking afflictions of animals trapped in the hell of our oblivious consumer culture are “seen” as “a nothingness,” as Carol J. Adams bleakly observes in her discussion of the disappearance of living, breathing sentient beings into food objects, pharmaceuticals and other consumer items in which the animals who suffered and died miserably in their making are obliterated. In “Procrustean Solutions to Animal Identity and Welfare Problems,” I examine the plight of chickens and other animals through the symbol of Procrustes, a mythological bandit who captures wayfarers and forces them to fit his iron bed. “Watching his victims approach his stronghold, Procrustes stretches or shrinks the bed in advance to predetermine their failure to fit into it so that he may torturously reshape them to suit his will. If the victims are too tall, he amputates their excess length; if they are too short, he stretches them to size.” I suggest that Procrustes is a particularly fit symbol of the false anthropomorphism humans use to force nonhuman animals to conform to constructions that are fundamentally alien and inimical to them. Because the needs and desires of animals and the wishes and desires of the humans who exploit them seldom coincide, a Procrustean solution is sought whereby the animal/argument is either cut down to size or stretched to fit the agenda. Animals are physically altered, rhetorically disfigured, and ontologically obliterated to mirror and model the goals of their exploiters. The Procrustean solution cuts and pastes the bodies and identities of other animals so that we may do with them as we please. Critical Theory and Animal Liberation looks not only at the obviously hidden suffering of animals on industrial farms and in laboratories but at the plight of animals who suffer and die openly in front of our eyes through human causation. The intersection of our “liberating” industrial highway systems and the toll of animals wounded and killed by automobiles – not to mention this system’s massive ecological and habitat destruction – is grimly illuminated by David Soron in “Road Kill.” Soron shows how the quotidian ubiquity of animals maimed and killed by automobiles has spawned a profitable range of sadistic road kill toys, marketed to children, in which the animal’s mangled body is mockingly “abstracted from the violent encounter that caused its death,” similar to the way animals slaughtered for food are abstracted from the violent destruction of their bodies on display at the meat counter and mocked by advertisers as dying (eager) to be eaten. Humanity’s wrongful relationship with others animals is attributed in this book mainly to the corrosive effect of capitalism on our psyches and the baleful effects of mainstream philosophy in the history of Western culture. Animals through the ages have been variously portrayed as lacking souls, minds and feelings. Humanity by contrast has accorded itself an array of self-idolizing virtues and godlike attributes placing us closer to the invented deities we worship than to our fellow animal mortals. Even the doctrine of metempsychosis (transmigration of souls) has traditionally viewed nonhuman animals, not as individuals in their own right deserving of compassion and respect, but as possible embodiments of the unhappy souls of humans under penalty for their sins by being trapped in a lower life form. Depending on how this doctrine is interpreted, we either should not slaughter animals because they may harbor a human soul in disguise (e.g. Pythagorean doctrine), or else we should slaughter them in order to liberate the human soul trapped within the lowly body of the calf or chicken we coincidentally desire to eat (e.g. Hasidic doctrine). Capitalism and the Western philosophic tradition reflect, reinforce, and magnify our maleficence, but they are not its ultimate causes. Long before capitalism, people were physically and conceptually assaulting animals. Bullfights, cockfighting, gladiatorial spectacles, blood fiestas, voodoo rituals, Hindu animal massacres, Muslim animal massacres, kaporos ceremonies and countless other animal abuse practices predate capitalism across cultural and religious lines. Being called “sacred” does not save animals. Animals regarded as sacred have traditionally been mutilated and murdered in that very guise for that very reason. Animals deemed “sacred” disappear into symbolic, sacrificial designations and uses that are every bit as obliterating of their actual selves, as disrespectful and indifferent to them as individuals with feelings and lives of their own, as their disappearance into meat is. 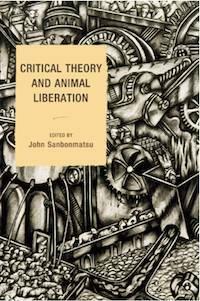 Critical Theory and Animal Liberation contains much more food for thought than I can begin to convey in this review. And whether capitalism is a cause of animal misery and abuse that a different economic system might alleviate, the fact is that modern capitalism is the overwhelmingly dominant system of ruthless cruelty in whose grip the majority of animals now live, labor, suffer, and die. For this reason, editor John Sanbonmatsu argues that animal rights campaigns cannot afford to ignore the capitalist enterprise in which animals are trapped, mutilated, murdered and shuffled around the globe by the hundreds of millions every single minute of every day and night. To ignore this reality, he says, “puts the movement at risk of merely displacing, rather than eliminating, particular forms of animal slavery.” Pharmaceutical, biotechnology, and agribusiness companies already outsource animal experimentation and factory farming to countries where labor is cheap and environmental and animal welfare laws are weak or nonexistent. Billions of people want cheap animal products and animals have no ethical protection, no ethical status whatsoever in the worldwide business community. The plight of animals under global capitalism is revealed in Feedstuffs, the weekly newspaper for agribusiness. An article on March 28, 2011 reports for example that the U.S. and China are renegotiating U.S. pig exports to China after the H1N1 swine flu virus epidemic in the United States caused China to ban U.S. pig imports in 2009. The year before the ban went into effect, “purebred swine exporters, collectively marketing under NSR’s [National Swine Registry’s] America’s Best Genetics program, had shipped a record 7,200 head of swine to China valued at $12 million.” Moreover, “the live swine trade issue was largely compounded by unrelated poultry trade conflicts between the U.S. and China that stalled negotiations,” Feedstuffs says. A question for animal rights activists is how to formulate effective campaigns that take global capitalism into account without burying the animals in a rhetoric of abstraction and conglomerating them in so many bundles of global issues and verbal obfuscation that, instead of helping them, we further their disappearance from public consciousness. An example of the many problems farmed animals face is the burgeoning business of farm animal welfare “certification” programs, ranging from “standards” set forth by industry trade groups like the National Chicken Council to groups sincerely interested in improving the lives of animals but without disturbing their status as food such as the Animal Welfare Institute. A new player on the certification stage is the Whole-Foods-initiated nonprofit organization called Global Animal Partnership. Founded in 2008, GAP rates the husbandry practices and conditions of factory-farm companies willing to pay for this service in order to boost their business, on a scale of 1 to 5, and markets the ratings to consumers. The details of the overall certification enterprise exceed the limits of this review, but there is every reason to expect that the travails of farmed animals will increasingly be marketed in Smiley Face guises of so-called Compassionate Standards. Whole Foods and its imitators, as John Sanbonmatsu points out in Critical Theory and Animal Liberation, have found a way to increase consumption of animal products through a slick rhetoric of “green” capitalism and “humane” farming couched in campaigns that, appearing to care about animals, actually exploit them and sabotage animal rights. Fortunately, the ethical vegan movement is growing. It is up to all of us who truly care about animals, who hear their voices and respect them for who they are, to swell this movement mightily and bring others – all others – along with us. Thus far, the desire for mastery has outstripped our disposition of sympathy with animals, but we can change ourselves and the course of our culture if we want to. John Sanbonmatsu is associate professor of philosophy at Worcester Polytechnic Institute. He is the author of The Postmodern Prince.